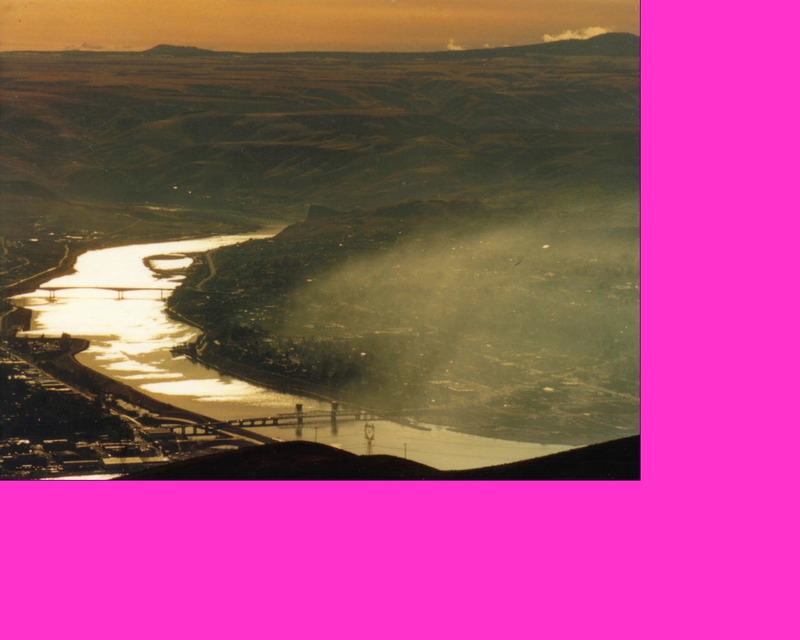 One of the first pictures I ever took with my new Olympus IS-1 camera, Lewiston, Idaho. It was my 25th birthday so I spent all day cruising around south of Spokane in search of Hell's Canyon, a 7900 foot deep abyss, the deepest low-relief canyon in the world, just on the Oregon/Idaho border. Lewiston was set at the entrance of the Snake River Canyon, the site of many future races. It always smelled like seagull droppings down there, but I got used to it. I grew to like the smell of seagull crap. It's a 2000 foot drop to the town from the side of the gorge. Off in the distance is the Snake River canyon. I never knew this place existed--Spokane, Washington was like that. You'd just go driving and find a place of beauty--a small canyon, a scenic river, a dam, a waterfall, a mountain. I never did get to Hells Canyon, but decided to postpone that honor to be shared with my future wife. Miimii had just called...she would be arriving in the United States on December 21, and we would get married. The whole event, from meeting Miimii to this day caused me to wonder--was I really a man? Women didn't seem so great after I had one. It was a bit surreal and I remember, after renting the apartment for Miimii and I, just a few days before she arrived, lying in my apartment after talking to Mom. I was in the dark house and began praying intently,"God, SPEAK TO ME!" I was dead serious in my own 'in your face' way. Where are you God??? I lay silent for a few moments and a voice entered the room, piercing the complete silence. It was a muffled one. I listened...is God speaking to me? "If you want to make a call, please hang up the phone and dial again--this is a recording, 8124". I'd left the phone off the hook. True story.